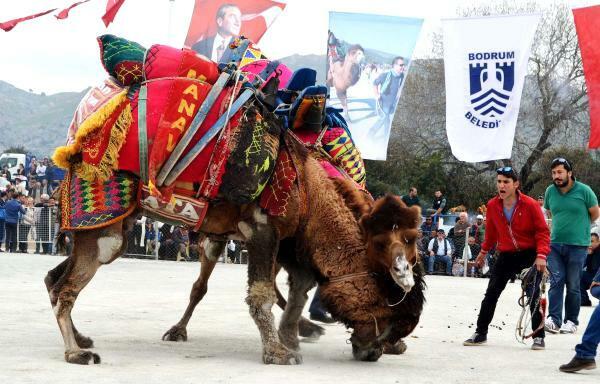 The flag of Bodrum, used horizontally (photo) or vertically (photo, photo) is white with the municipality's emblem. "Belediyesi" means "Municipality". The emblem features, in a sketchy manner, Bodrum castle. The amphora must represent the Museum of Underwater Archaeology housed in the castle. The unofficial origin of the Bodrum Museum (website) dates back to 1959 but it was not officially open to the public until 1961. Haluk Elbe was the very first Director of the museum and the first funding to the museum was only $50 USD from the Turkish Government. The funds were needed to help repair all the damage done to the castle walls and to make the rooms safe for visitors to walk in and visit. Divers have recovered thousands of these reserved amphorae which were once originally used to transport goods. Some of the main divers for the exhibit were Peter Throckmorton, Mustafa Kapkin and Honor Frost. They were doing diving expeditions in 1958 to find ancient artifacts for the museum. Restoration efforts were started by Haluk Elbe who spearheaded the effort to get the castle up to code and operational. Another director however, Oğuz Alpözen, was responsible for making the museum come to life under a “living museum” concept that he invented. This concept has attracted hundreds of thousands of tourists yearly since the inception. The Bodrum Castle (Castle of St. Peter) is located on a small rocky peninsula set between two sheltered bays in Bodrum, on the south-west coast of Anatolia. This peninsula inhabited and known in the ancient world as Zephyrion and was probably used as a rear base by the Byzantines in the early Middle Ages and then by the Turks. The Castle was built by the Order of St. John of Jerusalem (also called Knights of St. John, Knights Hospitallers, Knights of Rhodes) under the mastership of The Grand Master Philibert de Naillac, at the beginning of 15th century A.D., and ruled by them almost 120 years until the conquest of Rhodes by Suleiman I in 1522. In Ottoman Period, the Bodrum Castle was used as a small garrison base and in 1895 it was transformed into a prison. During the 1st World War, the castle was bombed on the 26th of May 1915 by a French battleship. This caused great damage to the castle, the prisoners were moved inland and the castle was evacuated. Then the Italians invaded Bodrum and they posted their soldiers at the castle and used it as their headquarters. Following the success of the Turkish War of Independence under the leadership of Mustafa Kemal on the 5th of July 1921, the Italian military forces were dispersed. Between the years 1939-1945 during the 2nd World War, the Castle was yet again used as a military base but was evacuated at the end of the war. Today, the Bodrum Castle is home to the Museum of Underwater Archaeology, which is unique in Turkey, and one of the most significant Underwater Archaeology Museums in the world. The Bodrum Castle preserves its original plan and character of Knights’ period and represents Gothic architecture. Since The Order of the Knights of St. John was a multinational organization with members from several countries of Europe, each Order had its own tower, each in its own style. The Castle consists of the French, Spanish (Snake), German, Italian and English Towers. The knights had placed hundreds of painted coats of arms and carved reliefs on the walls above the gates. Two hundred and forty-nine separate designs still remain, including those of grand masters, castle commandants, countries, and personal coat of arms of knights and religious figures. Among those the most noticeable one is the coat of arms of King Henry IV of England on the English Tower. The defenses originally consisted of a single certain wall, but an outer wall reinforced with towers (Carretto and Gatinau Bastions) was added and embrasures were inserted at certain points for cannons at about middle of the 15th century A.D. The other structures of the Castle are north moat, large ravelin, harbor battery, harbor tower, forecourt, inner gatehouse, chapel and inner bailey. In the inner castle, wide areas were excavated in the natural rock to form cisterns for collecting rainwater. In addition to this main character of the Castle, traces of the ancient world can also be seen on the walls because some pieces of the Mausoleum ruins, which was the one of the seven wonders of the ancient world, were used as construction materials. There are Ottoman additions like minaret on the chapel and Turkish bath (hamam). With this features, Bodrum Castle presents multilayered historical and cultural perspective. - an Ottoman army flag (17th c.). - Jacques de Milly (1545-1461). The flag of Bitez (photo) was white with the municipality's emblem. "Belediyesi" means "Municipality". The former municipality of Gümüşlük (4,046 inhabitants in 2013) is located 25 km of Bodrum. The flag of Gümüşlük (photo) was white with the municipality's emblem. "Belediyesi" means "Municipality". The emblem of the former municipality featured two arches representing the ancient town of Myndos. Myndos, known through its coins and the quite frequent mention made of it by ancient historians and geographers, was inhabited by a Greek colony from Troezen. It was situated on the coast of Caria, lying a little north-west of Halicarnassus on the most northerly of the three Dorian peninsulas. Although a seaport and fortified town, its ride was an unimportant one, the chief event in its history being that, aided by Halicarnassus, it repulsed an attack by Alexander the Great. The Notitiæ episcopatuum allude to it as late as the 12th or 13th century as one of the suffragan sees of Stauropolis. However, only four of its bishops are known: Archelaus, who attended the Council of Ephesus in 431; Alphius, who assisted at the Council of Chalcedon in 451; John who was present at the Council of Constantinople in 680; and another John who went to the Second Council of Nicæa in 787. The remains of a pier and some other ruins are to be seen. The former municipality of Konacık (11,104 inhabitants in 2011) is located just south-east of Bodrum. The flag of Konacık was white with the municipality's emblem. "Belediyesi" means "Municipality". The emblem of the former municipality features columns representing the ruins of the old town of Padasa. Newly opened to the public, Pedasa has two separate sets of ruins. First off there are the fortifications ringing the hilltop acropolis and enclosing the remains of shops, houses, even a palace, and then there are the ruins of a temple to Athena, a guard-house and a stretch of paved Roman road at the bottom of the hill. As so often at sites with histories as long as this one, there's little left of the Lelegian presence although the lower parts of the walls are believed to date back to the seventh century B.C. Instead, most of what remains today dates from the later Roman occupation. It was Herodotus who first mentioned the Lelegians, a people, he said, who had first settled in the area south of Troy and then migrated towards Halicarnassus (Bodrum) after the end of the Trojan War. It was only in 2008 that an inscription found inside the ancient temple confirmed that this was indeed the site of Pedasa. The flag of Mumcular (photo) was white with the municipality's emblem. "Belediyesi" means "Municipality". The flag of Ortakent Yahşi was white with the municipality's emblem. "Belediyesi" means "Municipality". The flag of Turgutreis (photo) was white with the municipality's emblem. "Belediyesi" means "Municipality". The flag of Yalı (photo) was white with the municipality's emblem. "Belediyesi" means "Municipality". The former municipality of Yalıkavak (8,701 inhabitants in 2007) is located at the northern tip of the Bodrum peninsula, 20 km of Bodrum. The flag of Yalıkavak was white with the municipality's emblem. "Belediyesi" means "Municipality". The emblem features the Yalıkavak windmill (photo, photo), built in 1859 and restored in 2005 using original technology. BB Bodrumspor was established in 1931 as Bodrumspor; the club's name was updated when taken over by the municipality of Bodrum in 1998. The flag of BB Bodrumspor (photo, photo, photo) is white with the club's emblem. The emblem features the same elements as the municipal emblem. The flag of BODTO (photo, photo) is white with the organization's logo.